3 days, 230km ride. 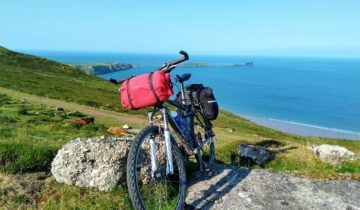 The original and probably still the best coast to coast ride across England – a combination of traffic-free trails, lanes and non technical off-road riding, all in some of the finest scenery in England. Starting at the Irish Sea Coast Lake District, you cross the Lakes, the Eden Valley, Pennines, Northumberland dales and finally arrive in Newcastle or Sunderland on the North Sea coast. It has great scenery and riding, wonderful views and very enjoyable, varied riding. It’s very, very popular so if you want to avoid sharing the route with charity challenge riders, large groups and guided holiday trips think carefully about when you go – see ‘Practicalites’ below. Almost everybody rides the C2C from west to east – the prevailing wind is behind you and you get longer downhills and shorter uphills. How long it takes depends on the sort of trip you want – generally 3 days if you’re camping will give you plenty of time. We did it in two days, with a very long first day to Allenheads, which gave an intense and memorable day’s ride crossing both the Lakes and the Pennines. After dipping a toe in the Irish Sea at Whitehaven, you take cycle trails through a generally flat/undulating coastal area of the Lakes before climbing up to Whinlatter Pass and then taking some forestry tracks down towards Thornthwaite and then on to Keswick. Keswick is virtually full of cafes, food and gear shops so it’s a good place for a second breakfast. The section from Keswick to Penrith is generally flattish, easy riding as you find a way between the hills of the northern Lakes and the Hellvelyn range to the south. The old coach road from Threlkeld to Matterdale gives a steeper and rougher off-road alternative. The section from Langwathby to Allenheads is probably the finest part of the route as you first cross the Eden Valley before climbing onto, and traversing, the Pennines before heading into the empty moorland hills of the Northumberland. There are some tough climbs and a mixture of terrain both on and off road which make it a very satisfying section of riding. If you need supplies or a bike shop then Alston, a small market town, is just the couple of miles off the route near Garrigill. 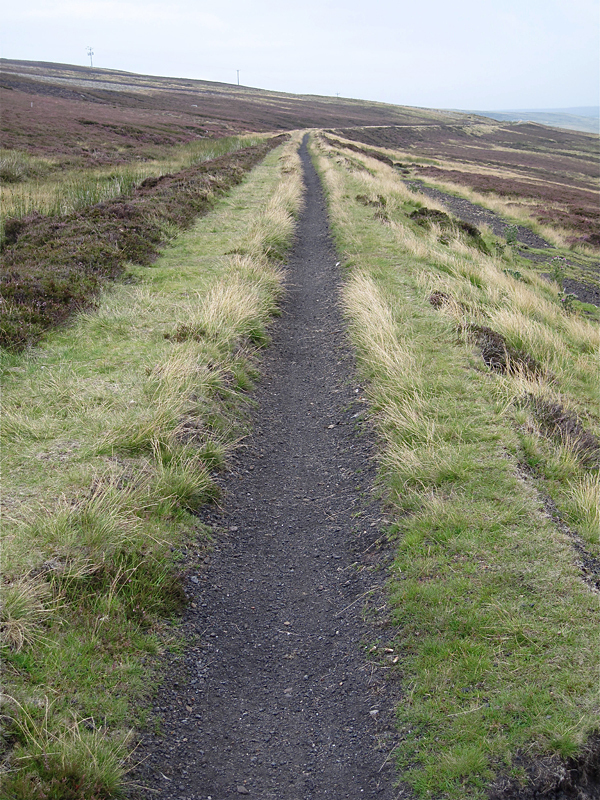 From Allenheads you climb steadily out of the valley and cross the last part of the Pennines before picking up tracks and then cycleways on disused railway lines through the post-industrial landscape of the northeast before arriving at either Sunderland or Newcastle. This section is such a contrast to the previous part of the ride across the hills and uplands. 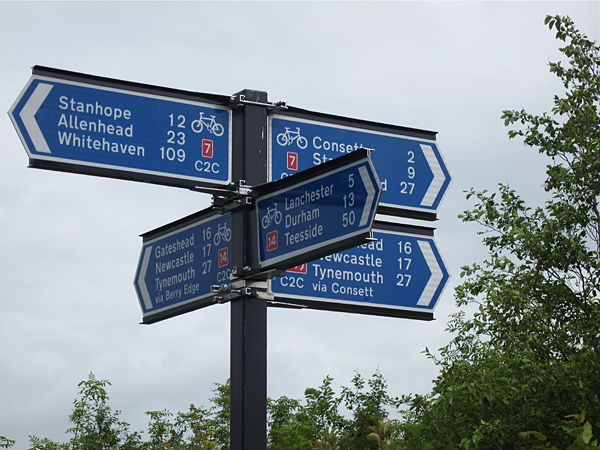 It finishes with fairly easy riding along the cycle tracks and takes you straight to the coast either at Sunderland or Newcastle – see the Sustrans map for details. Either place is a good one to finish in – the city seascape is a great contrast to all the riding the last few days. Supplies. There’s plenty of places to buy food in the villages you pass through, plus cafes as well.